Arboretums are collections of beautiful tress (and often other plants), botanical bevvies of trees for the public to admire, photograph, and linger under. Anyone with a passion for nature should visit at least one, so we have created a list of 55 must-see arboretums that offer stunning views and impressive experiences for all visitors. Website located here https://www.sproutabl.com/arboretums/. Billions of trees are felled each year, according to the Rainforest Action Network, and planting a tree requires more time and effort than cutting one down. That makes keeping up with deforestation rates challenging for conservationists. The minds behind one tech startup think they can speed up global tree-planting efforts by taking the burden off humans and placing it on drones. BioCarbon Engineering has assembled a fleet of drones that can plant thousands of trees a day, as Fast Company reports. The company will soon focus its efforts on Myanmarâ€™s Irrawaddy River delta, an area thatâ€™s seen rapid loss of its mangrove trees due to aquaculture, agriculture, and logging. Estimates place the amount of regional mangroves destroyed in the past 30 years between 75 and 83 percent. Starting in September, BioCarbon will partner with Worldview International Foundation to aid restoration efforts started by human hands. Spreading seeds from aircraft (like helicopters) is not a new strategy. These methods are valued for their speed, but chances of tree survival are hurt in the process. To come up with an efficient way of planting that doesnâ€™t damage seeds, BioCarbon had to get innovative. After the company maps a plot of land from above and analyzes the best spots for planting, their drones fly low to the ground and fire nutrient-packed seed pods into the soil. This way, more seeds end up in places where theyâ€™ll thrive rather than on rocks or in streams where theyâ€™ll go to waste. With one human pilot for every six drones, the company is able to get 100,000 pods in the ground a day. Even in places with regulations restricting pilots to one drone at a time, the vehicles are 10 times faster and half as expensive as human labor. Worldview International Foundation, which has worked with the Irrawaddy delta community to plant 750 hectares of trees so far, hopes to expand that area by 250 hectares with help from BioCarbon Engineering. The team also plans to continue employing locals to assemble seed pods and cultivate saplings. As 362 US Mayors representing 66 million Americans, we will adopt, honor, and uphold the commitments to the goals enshrined in the Paris Agreement. We will intensify efforts to meet each of our cities’ current climate goals, push for new action to meet the 1.5 degrees Celsius target, and work together to create a 21st century clean energy economy. The world cannot wait — and neither will we. Since 2009, Trees for Neighborhoods has helped Seattle residents plant over 7,300 trees in their yards and along the street. That's 7,300 more trees working to clean our air and water, make our streets more walkable, and our neighborhoods healthier! See where the trees are planted. APPLY NOW Application period closes on Monday, August 14. Plant a Tree in 2017! Trees for Neighborhoods takes place every year. The application opens in July and trees are distributed in the fall. Evaluate your planting site and this year's tree options. Click here to view this year's tree options.Select the tree best suited for the space. Under power lines? Select one of the power line approved tree. Planting along the street? Review the minimum planting strip width requirements before selecting your tree. Backyard space? Choose the largest tree appropriate for your site. Apply for trees. Due to limited availabilty of some species, applications will be randomly selected after the application period has closed on August 14. Not everyone who applies will receive trees. Follow this link to apply for trees. In the fall, pick up your trees and attend a planting workshop to learn how to plant and care for them. Tree pickup and workshop events will be held on Saturday, October 21 and Sunday, October 29. On these days you can come any time between 9 am - 2 pm. Plan to be there for about 1 hour. You can choose either date when you apply. Tree pickup and workshops are at the University of Washington's Botanic Gardens. Bring your trees home and plant them Stay connected to Trees for Seattle and receive tips and tree care reminders to keep your trees healthy. Download the 2017 tree guide to help you decide which tree is best for your space or share with your friends and neighbors. All across Puget Sound, local governments are seeing diverse benefits to helping private landowners build rain gardens. Generous incentive programs continue to be rolled out so check back if your area isn’t listed yet. Lake Forest Park offers mini-grants for rain gardens. The city of Puyallup offers technical assistance and a cost-share program to homeowners who install rain gardens. Kitsap County supports rain gardens and the Kitsap Conservation District Rain Garden Cost-Share Program for homeowners is also well underway. Contact Teresa Brooks at (360) 337-7171 Ext. 24 for more information. 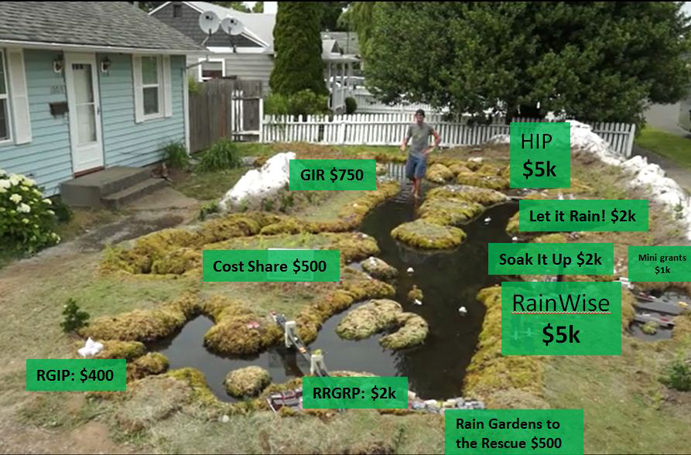 The cities of Olympia and Lacey both offer incentives for rain gardens. Port Angeles is offering rebates to homeowners who build rain gardens and disconnect downspouts. Learn more here. The city of Everett offers their “Let it Rain” rebate program to homeowners. More info here. More incentive programs are being developed in other cities across the region, so check back here or ask your local city or county office if they offer rain garden incentives or will be offering them any time soon. We will have about 30 tree's and bushes that need to be planted in the location below. Planting in this area will have a cooling effect on the pavement of Sports field drive, it will help retain water and prevent excess water and flooding to the fields below, provide habitat for wildlife as well as take in and store over 1000 lbs of Carbon! Not to mention naturally purifying the air and water that get filtered through the tree's and plants. We need your help! Maryland now provides free trees to eligible land owners to help convert lawns to woodland! This means cleaner air and water, less carbon dioxide, and less pollution from lawnmowers and fertilizer.